In public relations, it’s always gratifying to be recognized by one’s peers. Typically, that recognition comes in the form of industry awards. Right now we’re finalists in a couple of awards competitions, and we’ve won our fair share as well. So, we thought it might be a good time to review what helps make a winning PR campaign entry and what ought to be avoided in pursuit of award excellence. Do plan far in advance. We find it particularly helpful to keep an awards file at the beginning of any PR campaign. It should include plans and strategy memos, weekly recaps, media coverage and all results reports. Importantly, keep correspondence with positive quotes about the work as well as images and video. The average award entry takes a couple of days to put together, but you can cut that time dramatically by staying on top of resources from the outset. Do prioritize. And we don’t mean just a spreadsheet of titles and due dates. Preparing a high-quality award entry is expensive, so it’s best to set a budget for entry costs and personnel time for the effort, then review each award to see which are most meaningful. We also recommend reviewing past winning entries and gaining some intel on what each competition is looking for in the process. For example, understand the difference between the Bulldog Awards (geared to excellence in media relations) and the SABRE Awards (looking more at winning strategies.) There are also the Silver Anvils, Platinum PR and PR Week Awards. New competitions crop up often, so it pays to keep up-to-date. Don’t limit yourself to the “obvious” category. Just because a team launched a new B2B tech service doesn’t mean that the B2B tech category is best for the entry, and often it pays to enter in more than one category. Next, ask yourself if the entry stands out enough to warrant winning in a crowded field. If not, it may be better to go for a tactical award and instead submit for “Best Video” or “Best Infographic” rather than a campaign award. Be strategic about your entries. Keep in mind the agency and individual awards as well. These are two terrific ways to showcase an agency or an individual’s career progress. Do appoint a gatekeeper. It’s helpful to appoint someone to shepherd the entry, plan according to deadlines to avoid late fees, and make the final pass on content, adherence to award rules, and grammar. It’s helpful to create a checklist of all entry requirements and go through it ahead of sending. Today, most entries can be submitted online, but beware; if you save as you go and return to the entry, reread in its entirety to make sure the writing is consistent and correct. Don’t forget to merchandise your wins. 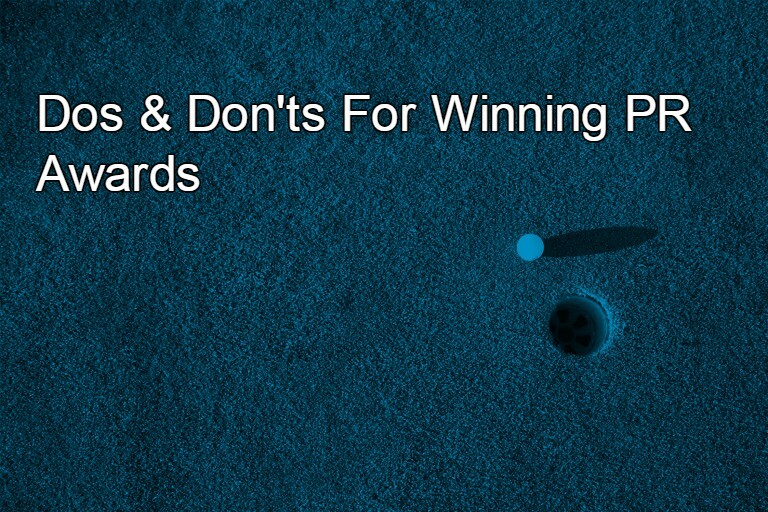 Each award win is an opportunity to burnish your team’s image, so share the good news. We recommend posts on all your social sites – video and other images from the awards event add a nice touch. For major awards, it can be helpful to issue a press release, post the news on the company website, include it in email signatures and incorporate updates into all relevant new business proposals and RFP responses. Do get involved behind the scenes. There are many benefits to be gleaned by volunteering for awards committees. One of our favorite opportunities is to act as a judge for one of the competitions. If you ever wondered what other PR teams were up to, judging offers a fascinating glimpse into all types of PR writing, strategy and creativity, and the work will provide inspiration for the future. It’s also a nice chance to network with some peers. For up-and-comers, consider working one of the award galas – here you can exercise event skills, work on speechwriting, video presentation or simply offer to handle the social and traditional media. Finally, it’s always good to think beyond PR industry recognition. There are awards for a great workplace, for entrepreneurship, women in business, diversity, and many others. One of the tenets of good public relations is having other say good things about your brand, and the third-party endorsement of industry awards accomplishes exactly that.